As you all know, I’m very happily married to bestselling paranormal author Desiree Lee. Both of us love being at signings, and other public appearances. We both love meeting our fans and readers. At the moment, we’re in the process of getting a couple of appearances/signings set up. One would take place later this autumn. The other would be a year from now. We live in the extreme northern-most part of California. We spend an inordinate amount of time in southern Oregon, too. If anyone would like to have two bestselling authors to appear in their bookstore – or any other business, really – for a signing, a talk on any topic pertaining to writing and/or publishing, please get in touch with us. You can reach Desiree via her website. The link for that is above. You can reach me via the “Contact” form on my own website. Any appearances or talks that we’re invited to partake in needn’t be limited strictly to writing or publishing, either. Both of us are bestselling paranormal authors. We’re both pagan – Desiree is general eclectic pagan, and I’m Wiccan. Both of us have life-long interests in the paranormal due to firsthand personal experiences. I also used to be part of a paranormal investigation group. Even setting our work aside, we can easily be of use at events centering around paganism, the paranormal, or cryptozoology. My own experiences dealing with sasquatch can be read here. So, if you think either of us – or both, preferably, since we’re such a team – would be a good fit for your business, or event for a talk or book signing, please let us know. If it’s at all possible for us to do so, we’ll be there! If such an event or signing would be outside the northern California/southern Oregon area, we do ask that transportation and lodging be provided. We are also quite happy to attend talks via Skype. See my recent blog post regarding that topic right here. A few times lately, I’ve mentioned a new film project that I’m going to be working on. The contract is signed. As I write this blog post, I’m only waiting on my copy of the contract to arrive in the mail. Soon as that happens, work on the script can begin. Eager as I am to get going on the script right now, it’s better, for several reasons, to wait until the contract is in hand before doing that. Also, as I’ve said before, I’m unable, or at least unwilling, to say much about the new film project at the moment. Once work is underway, I’ll post what I can, when I can. For this project I’ll be working with someone else. The story was created by someone else. I don’t want to blab their ideas, or even the title, without their permission. For now, I just want to make my fans and readers away of what I’m doing – as much as I can within the constraints given above – and let you all know that I have you in mind. I never forget about my fans! Please keep watching my website and blog for updates. Hopefully I’ll be able to start saying more about this new film project in the very near future. Recently, I updated the parts of this blog that don’t typically change – the “About” and “My Books” pages. For the “About” section, not a lot was added, or changed. What material is new, or different, should have been made so long before now. That’s my fault; I’ve simply been so busy with family and work that I’d forgotten it. The “My Books” section underwent a more radical change. Again, it’s something that ought to have been done long, long before I got to it. As you know, I’m no longer with publishing house who published “Predators or Prey?”, “Necromancer”, “Vindicated”, or “Shadow Castes: Book 1 – Aspects”. Those books are, for now at least, unavailable. They’ve been pulled from the “My Books” page. That same publisher had also picked up my first three books, which I had originally self-published, and released editions of them under their publishing house label, too. Those books were “Winter’s Rite”, “Well Wishes”, and “Gauntlet”. Those editions have likewise been removed from the “My Books” page. However, the original self-published editions – both paperback and e-book – are still there for your convenience. Hopefully, the existing Wendy Markland novels – “Predators or Prey?”, “Necromancer”, and “Vindicated” – and “Shadow Castes:Book 1 – Aspects” will be re-edited, and released under a different label in the near future. If and when that happens, there will, of course, be new cover art for those books. At such a time, they will be reinstated on the “My Books” page of my blog. Such re-releases would, also, lead to my continuing the Wendy Markland series. I have a plethora of ideas for more books in that series. When we reach that point, Wendy is going to find herself dealing with more than vampires, werewolves, and zombies! Also, the re-release of “Shadow Castes: Book 1 – Aspects” would open the door for my writing the second and third installments of that trilogy. Let me say, for fans of “Shadow Castes: Book 1 – Aspects”, I haven’t forgotten that trilogy. Circumstances have simply taken me away from it for the time being. Book 2 and Book 3 are outlined. If and when Book 1 gets a re-release via another publishing house, the releases of Book 2 and Book 3 will only be a matter of time. Recently, my wonderful wife Desiree Lee introduced me to the musical work of Mr. Tom Smith. The man is a genius – both at music, and comedy. As the tagline on Mr. Smith’s website says, “Music in every style…except dull”. He works in an array of musical styles. His songs run the spectrum from dark drama to comedy. One song of Mr. Smith’s that’s a particular earworm for me is called “The Ballad of Rupert“. I’ve told my wife a few times – and she agrees – that the song would make the basis of a great movie. I would love to write the project! I’ve messaged Mr. Smith regarding this, but have yet to receive a reply. Thus this blog post. It’s my hope that this post will catch Mr. Smith’s attention if my message to him ended up being overlooked. I know he’s been busy touring. I can’t even imagine how hectic it is to be on the road, zipping from one city, and one performance, to another, to the next, and so on. So, if in the rush and hubbub my message was overlooked, hopefully Mr. Smith will somehow, someday, be made away of this post. Mr. Smith – if that happens, and if you’re at all interested in the idea of my writing a screenplay based on your song “The Ballad of Rupert”, please get in touch with me via the contact form on my website. For everyone else out there, especially those of you who haven’t discovered Mr. Smith’s music, I hope this post has made you more aware of his work. Check it out. You won’t be sorry. Mr. Smith is an amazing talent. Enjoy! Several years ago, I was in talks with Mirage Studios – back before Peter Laird sold off the franchise – about doing some writing for the main “Teenage Mutant Ninja Turtles” comic book. I had four single-issue story ideas that Mirage was considering. I was also in touch with them about a full-length novel I wanted to write, that would take the TMNT back to their darker, grittier roots – the way I prefer them to be. I actually ended up being put in touch with Mirage Studios’s agent regarding that project. All of those fell through when the franchise sold, and Mirage Studios shut down. Also, I am a huge Batman fan. I have several Batman stories that I would love to write. Someone associated with DC Comics reviewed them several years ago. I was basically told “Not at this time”, and that was that. Since Amazon launched Kindle Worlds, I’ve been hoping for the TMNT and Batman to become part of that. If that were to happen, I might finally be able to write these stories, do so legitimately, rather than them being unlicensed fan fiction, and get paid for my time, efforts, and talent, too. Much as I love writing, it’s what I do. I need to be paid. I can’t just write these stories because I want to, and not see a return on them. Now, I’m reading articles on-line talking about how Kindle Worlds isn’t performing to expectations. I haven’t yet heard anything about Amazon shutting down Kindle Worlds, luckily, so there’s still hope. But, I’ve been wondering if there are other licensed fan fiction sites out there that are paying markets. Are there? I’ve yet to find any. If you know of one – or more! – please let me know via the “Contact” form on my website. Yesterday evening Desiree and I were able to attend the Second Annual Klamath Independent Film Festival, in Klamath Falls, Oregon. The film fest consisted of eight short films, the longest of which was 17:45. Each offering was excellent, and a pleasure to watch. We had a great time yesterday evening, and eagerly await next year’s film festival. 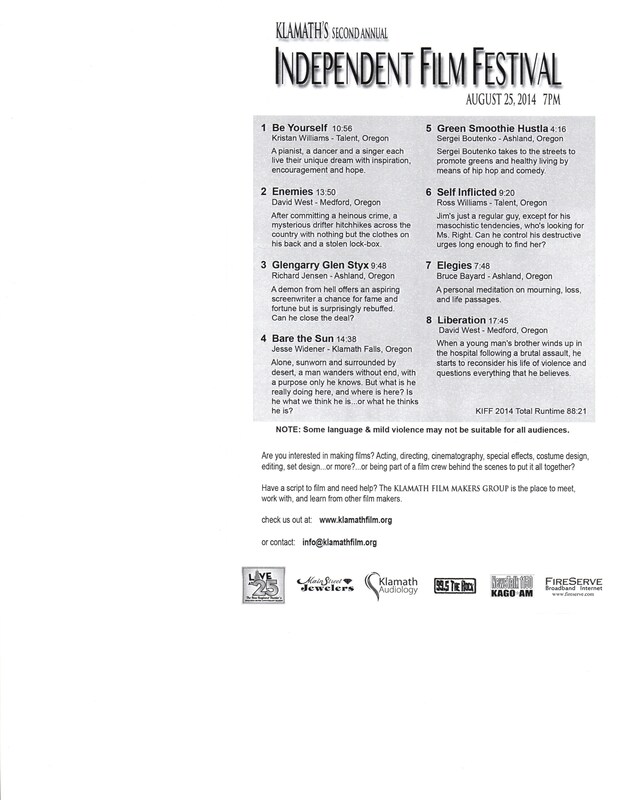 Last year, we missed the First Annual Klamath Independent Film Festival due to being away on our honeymoon. At least some of the short films shown last night are available on-line. Searching for them should turn them up for you if you’re interested. 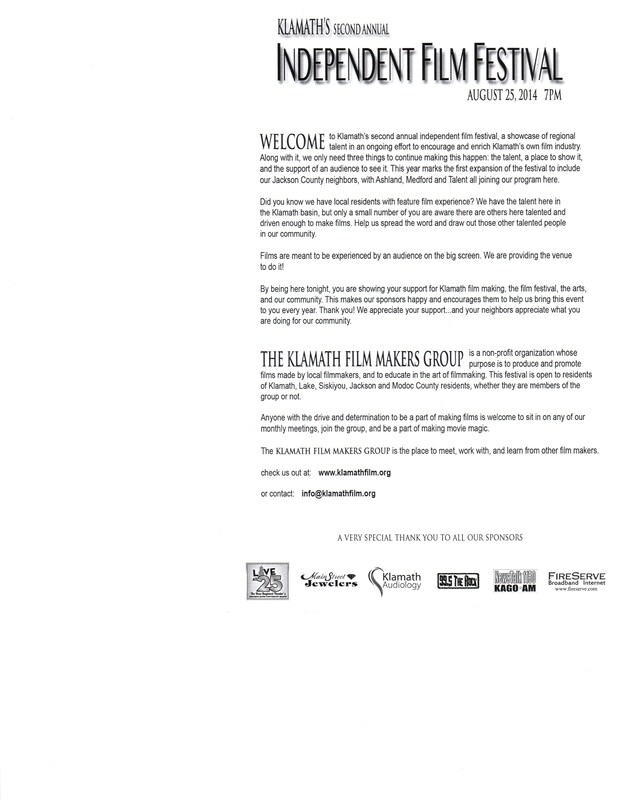 Please see the scans of the event flier below for a full listing of the names of the films, their creators, and the home city of each filmmaker. This year Desiree Lee and I will be attending the California Bigfoot Festival in Willow Creek, California. We very much hope to be able to attend the Bigfoot Jamboree at Happy Camp next year. We’re already in talks with them about promoting the sasquatch-themed novel we have in the works. And, though I don’t usually enjoy being in front of a group of people, talking, I wouldn’t mind being able to do a discussion on my own first-hand sightings and experiences with sasquatch while growing up in Ohio. Investigator Lon Strickler was kind enough to post an account of those in his blog some time back. As with this year’s trip to the California Bigfoot Festival, if we’re able to attend the Happy Camp Bigfoot Jamboree next year it would be a mixture of business and pleasure. With luck, we’ll be there promoting our work – especially the sasquatch-themed novel we have in progress. But, if we’re there, we’ll also simply be enjoying being there. Please keep watch on my website and WordPress blog for updates concerning this. If things do work out, and we’re able to be there next year, there’ll be plenty of updates posted here leading up to the event.